We're seeing a recurring theme as we go through all of the classes in OPTIMA's Search for the Ultimate Street Car, presented by Advance Auto Parts- you must first finish, in order to finish first. That appears to be the case in GTV, as well as GTS and as we look at the standings and registrations for the final double-points event in Fontana, we see that it is most definitely the case in the GTL class for cars weighing under 3200 pounds. Douglas Wind's lead in the GTL class wasn't substantial after the previous event at Pike's Peak and the points chase has tightened up even more since Road America. The saving grace for Wind is that second-place Brandon Ranvek, third-place James Forbis and fourth-place Tone Diaz have all received their invites to the 2015 OPTIMA Ultimate Street Car Invitational and are not registered for the double-points event at Auto Club Speedway. That grace is fleeting though, because fifth-place Martin Pond is registered for the event and he has not punched his ticket yet for Las Vegas. Because of the nature of the double-points event at Fontana, Wind will likely need to finish the event in order to secure his title in GTL. Even then, we project it to be a very close battle between the two competitors. The reason for this, is because Wind's current point total reflects the points earned at three events, while Pond's totals have come at only two events. That means Pond will substantially increase his point total in Fontana, while Wind will see his increase by about half that amount. What it boils down to is how the two square off against each other in all three double points events and it looks to be a very close contest. Wind edged out Pond at Michigan by less than seven points. The gap between the two again favored Wind at Charlotte Motor Speedway, but the margin was a scant .4667 points. That means Wind essentially carries a 7.2001-point advantage into the final event. There's your target Martin! The irony for Martin is that with a strong performance, he could win the GTL class and earn an invitation to the 2015 OPTIMA Ultimate Street Car Invitational. Had he not entered the event at all, he likely would not have accumulated enough points to even be considered for an invitation to Las Vegas. As the top-ten indicates, there were substantial changes in the standings at Road America, as several of the GTL heavyweights came out to Elkhart Lake. That moved Brandon Ranvek, Tone Diaz and Danny Popp up significantly in the standings, with Ryan Buck also making a big move in his Nova. We expect similar movement at Fontana and several West Coast competitors to make big jumps in the standings. Danny Popp has been so consistent this season, he is currently in the top-ten in both the GT and GTL classes. Depending on where someone sits in the points, competitors are either hoping he runs in one class or the other in Fontana. Since Popp will be defending his OUSCI title in his Corvette, that is the car he is likely to run at Fontana, which means he'll be in the GTL class in the final qualifier of the year. That's good news for folks who are on the points bubble and not running at Fontana, because that means Popp will be consuming some valuable points in a GTL class, where several competitors are looking to drive their way off the bubble and into Las Vegas for SEMA and the 2015 OUSCI. Obviously, good news for some folks is bad news for others. In the case of those signed up for the GTL class at Fontana, OUSCI hopefuls include Karl Dunn, Gregg Biddlingmeier, Joe Escobar, Rich Willhoff, John Lazorack III and Kenneth Allan Mitchell. Including Pond and Wind, who have also not yet secured invites, that makes eight competitors just in the GTL class hoping to get one of 15 available slots (16 if you include the GTL class winner/top finisher at Fontana). Their goal did get slightly easier when Rob MacGregor secured an invite in his 1969 Chevy C10 at Road America. 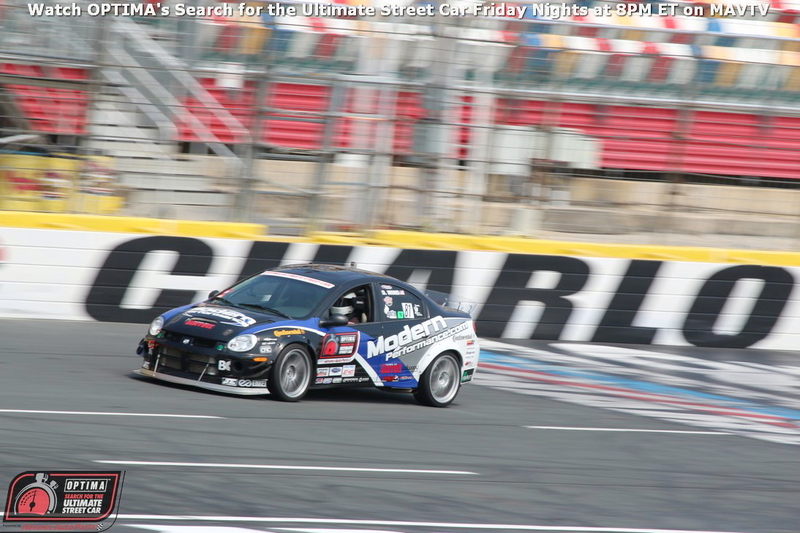 MacGregor has run in both the GTL and GTV class this season and previously-scored 207.2 points in GTL at Charlotte. Had he decided to enter in GTL at Fontana, he could've likely finished in a similar position and captured valuable points in the process. The same is true of Ken Thwaits, who recently began running a Mitsubishi Evo built by the RS Motors folks. Thwaits qualified the Evo at Road America (the fourth vehicle he has qualified this season) and as a result, he won't need to run the car for GTL points at Fontana. Competitors in other classes should be keeping a close eye on the performance of the GTL class at Fontana, because there are so many competitors who could point their way into the OUSCI with a strong performance at Auto Club Speedway. Just because this event is sold-out for competitors, doesn't mean fans of the series can't catch all the action. VIP Pit Passes are available for purchase online and as always, be sure to catch OPTIMA's Search for the Ultimate Street Car, presented by Advance Auto Parts, every Friday night at 8PM ET/PT on MAVTV.